The Testo 549 digital manifold is a breakthrough with unheard of value, truly making analog gauges obsolete. It precisely measures high side / low side pressure and instantly display the corresponding saturation / evaporation temperatures for 60 refrigerants. Rapid, 1/2 second updates on the backlit display make it easy to spot fast changing system trends in real-time and the 0.5% full scale accuracy of the pressure sensors help you nail down operating conditions. With optional temperature probes, automatic superheat and sub-cool calculations are instantly displayed. 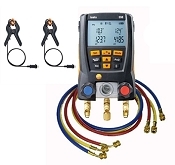 The versatility of 60 on-board refrigerant profiles means the Testo 549 digital manifold is the only gauge that you will ever need for almost all AirConditioning and refrigeration installation or service work, ranging from large tonnage systems to mini-splits. The proven, rugged design will give you years of dependable service. Testo has upgraded the unit with a redesigned frame seal to protect the display glass and make it more water resistant. Additionally, the temperature probe socket covers are designed to seal better. These factors combined make the product IP 42 (splashproof). 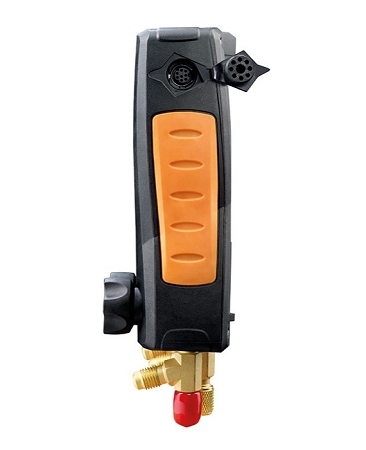 With optional temperature probes the Testo 549 digital manifold provides accurate, real-time superheat and sub-cooling at the push of a button. Two temperature inputs allow simultaneous calculation and display of superheat and subcooling. With just a press of a button, the differential temperatures are also displayed. With another press of a button, you can quickly switch between the different measurements. 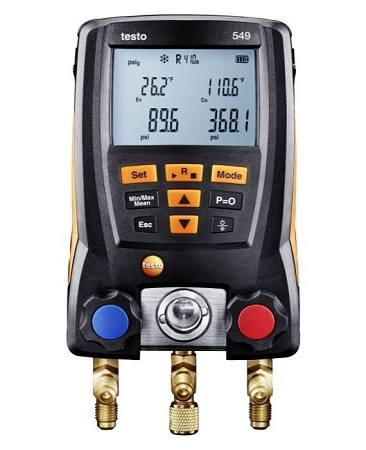 The testo 550 features a large, backlit LCD display. Large numbers help you easily read the values. Intuitive operation provides you the ability to quickly analyze and diagnose the system without changing connections or performing tedious calculations. In a few seconds the instrument displays all of the values you need for an accurate and precise analysis. 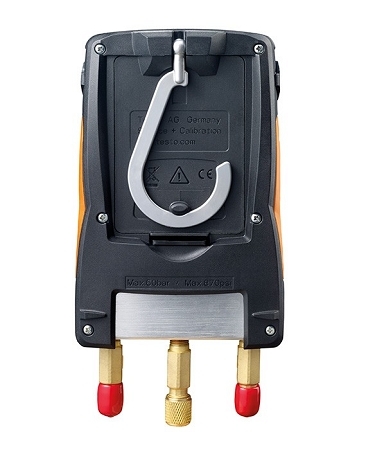 The testo 550 incorporates a compact design that is easy to use, carry and set up. The testo 550 has a durable housing that protects the analyzer from the everyday bumps and drops. It is truly built for the field. The testo 550 is a full function analyzer. 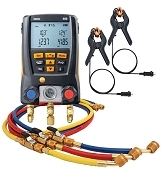 With 60 refrigerant profiles stored on the processor and unique temperature-compensated sensors, the testo 550 is one of the most accurate analyzers on the market. Say goodbye to the old fashioned PT charts! With a testo 550 Refrigeration System Analyzer, multiple tests are performed and calculated all at once. Just select the results you want displayed and away you go! Once connected, you can perform a leak test and monitor charging. Refrigerant flow can be monitored in the integrated (magnified) sight glass. Superheat and subcooling can be measured and displayed in real time! Two direct access buttons offer you more advantages one for the display of MIN/MAX/MEAN (average) readings, and the other for instant access to 31 user selectable refrigerant profiles. Hose parks that swivel - now that's cool. Q: Are the temperature probes wireless. If not, is a tester available that has this option? A: The testo 549 probes are plug in. 2 wireless pressure probes and 2 wireless temperature clamp probes make up the kit. Also popular is the iManifold / iConnect system.